If you’re a user of Netflix’s Watch Instantly service you’ve no doubt come upon at least a couple videos that are too quiet to hear without straining, even with your speakers cranked. Mac users: Fear not. The audio-twisting protozoans at Rogue Amoeba have an app called Audio Hijack Pro, the Swiss-army knife of Mac system audio. In addition to letting you record audio from any Mac OS X application (while it is running), it also allows you to apply various effects to the live audio stream. Obviously, in order to use Audio Hijack, you have to download it. Do so. The one we’re interested in is turning up the Gain, which will actually pump the Audio coming from Safari up over the “100%” system limit. For now, though, you have to load up your movie on Netflix. I’ll assume you now how to do this, otherwise you wouldn’t even know if you had a problem with quiet audio. While the movie is playing, switch back to Audio Hijack. This was we can tweak the audio in real time, to get the right volume. Click the slider on the Gain control in the top left of the Effects window shown in the picture above. Drag it to the right to pump up the volume, up to a maximum of 238%. That should be plenty for any quiet Netflix movie. 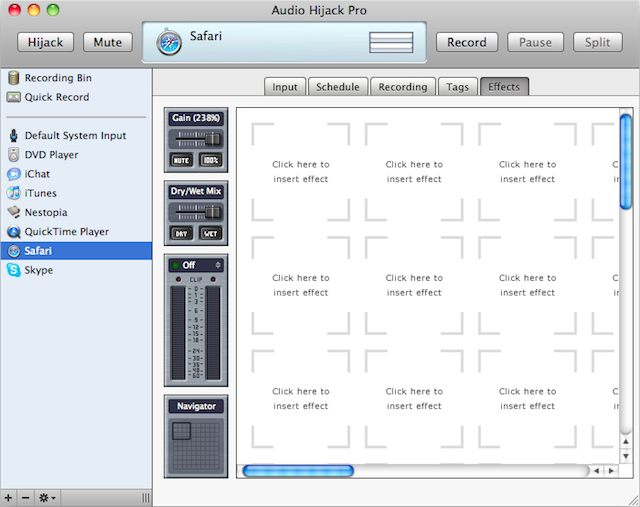 Due to the general awesomeness of Audio Hijack, this trick works for ANY application in OS X.